Included here are notices of lectures, conferences and other gatherings or events of Antarctic interest that appeared in 2001 or earlier under 'Antarctic Events' but are now history. Last updated: 11 June 2003. Launch of the South Georgia Association (14 December 2001. Linnean Society, London). Discovery Centenary Dinner (10 December 2001. Warner's Hotel, Christchurch). Antarctican Society Annual Meeting and Lecture (1 December 2001. Cosmos Club, Washington DC). Beetles on the Beardmore - Antarctica before the Big Freeze (1 December 2001. SPRI, Cambridge). From Rainforest to Icefield: Recent Paintings by Lucia DeLeiris (18 November 2001. Arnold Art Gallery, Newport RI). Friends of SPRI Annual General Meeting (17 November 2001. SPRI, Cambridge). Sara Wheeler on her new book "Cherry" (14 November 2001. Royal Over-Seas League, London). Halley Bay Reunion (10 November 2001). James Caird Society, Lecture and A.G.M. (9 November 2001. Dulwich College, London). Scott's Discovery Expedition Centenary Celebration - Ran Fiennes (1 November 2001. RGS, London). Polar Extremes: Art from Frozen Places (25 October - 30 December 2001. Meridian International Center, Washington DC). With Admiral Byrd at the Movies (20-21 October 2001. Byrd Polar Research Center, Columbus OH). 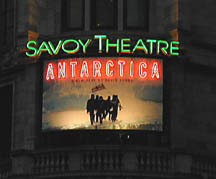 Premiere - Shackleton's Antarctic Adventure (18 October 2001. London). Michael Smith on his new book "An Unsung Hero" (11 October 2001. Chiswick). Opening of 'Antarctica' -- the play (9 October 2001. Savoy Theatre, London). Lectures at SPRI (29 September - 17 November, 2001. SPRI, Cambridge). 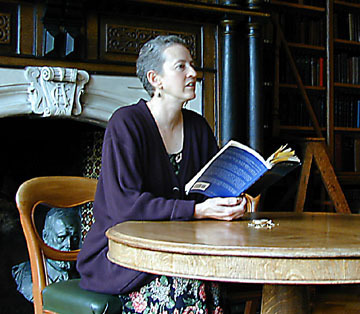 Poetry Reading by Melinda Mueller (27 September 2001. Dulwich College, London). 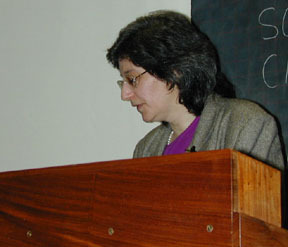 Susan Solomon on her new book "The Coldest March" (12, 27, 29 September, 6 November 2001. Washington DC, London, SPRI). Unveiling of Captain Scott Memorial (6 June 2001. Cardiff). James Caird Society Meeting (18 May 2001. Dulwich College, London). Antarctic Symphony Premiere (6 May 2001. Royal Festival Hall, London). Lucia deLeiris on 'Penguins and Seals: Sketching in the Antarctic' (13 March 2001. Harvard Travellers Club, Boston). 'Shackleton: The Antarctic and Endurance' An Exhibit (31 October 2000 - 25 February 2001. Dulwich College, London). 'Echoes in the Ice -- Exploration and Science in Antarctica' Third Byrd Colloquy (27-28 October 2000. Byrd Polar Research Center, Columbus OH). 'To the Ends of the Earth: Exploring the Poles' An Exhibit and Talks (7 October 2000 - 13 January 2001. Newberry Library, Chicago). American Polar Society Conference (4-6 October 2000. University of Colorado, Boulder). South: The Race to the Pole (14 September 2000 - September 2001, extended to 31 January 2002. National Maritime Museum, Greenwich). Polar Artifacts from the Collection of Dr. John M. Levinson -- An Exhibit and Talks (to 30 August 2000. Delaware Museum of Natural History, Wilmington DE). 'Endurance' A Play (2-6 August 2000. Andy's Summer Playhouse, Wilton Center NH). 'From Ireland to Antarctica: Sir Ernest Shackleton -- A Very Successful Failure' A talk by Jonathan Shackleton (7 July 2000. Amos Fortune Forum, Jaffrey Center NH). 'The Endurance: Shackleton's Legendary Antarctic Expedition' An Exhibit (23 June - 10 September 2000. Peabody Essex Museum, Salem MA). 'Antarctic Art & Artifacts and other Odds & Ends' An Exhibit (19 June - 31 October 2000. CRREL, Hanover NH). 'Terra Nova' A Play (24 April - 19 May 2000. Project Y Theatre Company and Washington Shakespeare Company). 'Terra Nova' A Play (10 March - 5 April 2000. Cotuit Center for the Arts, Cotuit MA). Second Byrd Colloquy (15-16 October 1999. Byrd Polar Research Center, Columbus OH). 'Sir Ernest Shackleton and the Endurance Expedition; A Family Perspective' A Talk by Jonathan Shackleton (9 October 1999. Woodstock VT). An Inaugural Meeting of the South Georgia Association will be held in London at the Linnean Society, Piccadilly, on 14 December 2001 at 6.30. We intend then to adopt a constitution for the Association and agree to a programme for the year 2002. This will be followed by a short presentation by Nick Lewis on "Shackleton on Screen" Ð the making of the new IMAX film. This will be followed by socialising at a pay bar until 9.30. South Georgia is a unique sub-Antarctic island of exceptional natural beauty and with wonderful wild life on land and at sea. It is an overseas territory of the UK administered by a Commissioner based in the Falkland Islands. It is home to two scientific stations of the British Antarctic Survey and a few government employees. It has an interesting heritage, is environmentally vulnerable, very precious, and very worth defending and preserving. - To encourage interest in, and concern for South Georgia in the United Kingdom and other countries. - To encourage the study of South Georgia and promote the conservation of its natural and cultural heritage. - To promote contacts and encourage fellowship among those who have lived and worked in or around South Georgia, have visited or are interested in the Island. Who do we hope will join? Anyone who shares our affection and concern for South Georgia and wishes to follow developments there. We are now circulating a number of people and organisations with South Atlantic interests and we hope you will join us. The Membership Fee will be £15 annually or £50 for a five year subscription. What shall we do? To further our objectives, we envisage one or two meetings a year in Britain, plus a visit to an organisation, ship or site of South Georgia interest. We intend to produce a newsletter twice yearly, which will report on events in South Georgia and developments which will affect the Island, and have features on its history, wildlife and other topics. We shall draw up a full programme in response to the wishes and suggestions of our membership. Finally we shall circulate a list of our members. Even if you cannot attend we should welcome views on our objectives and ideas for our programme. Bob Burton, John Croxall, Angus Erskine, Patrick Fagan, William Fullerton, John Heap, Rex Hunt, Pat Lurcock, Sarah Lurcock, Skip Novak, Stephen Palmer, Sally Poncet, Trevor Potts, Alexandra Shackleton, David Tatham and Lance Tickell. --Excerpted from a flyer dated December 16, 2001 [sic]. NOTE: For contact information go to 'Antarctic Organizations' elsewhere on this site. UPDATE: "We had our inaugural meeting of the South Georgia Association last night, with 60 attending. It went very well. We are planning a number of meetings next year, including the 20th Anniversary of the Liberation of South Georgia on 24 April. The AGM is set for 24 May." --From an e-mail from Bob Burton. "On 10 December 2001 a dinner was held at Warner's Historic Hotel in Christchurch, New Zealand. It was exactly one hundred years to the night an elaborate banquet was held by the citizens of Christchurch for Captain Robert Scott and his officers of the "Discovery". The menu replicated some of the original dishes and a great night was had by all. Guests of honor were Sir Ed and Lady Jane Hillary. David Harrowfield was instrumental in assisting with the organisation. Warners have pledged their support to the Trust as a result of the evening." --From 'Heritage Hearsay', issue 29 (February 2002), the newsletter of the Antarctic Heritage Trust. "[Warners] has a collection of post-1982 memorabilia associated with the US Antarctic Program. Includes ball caps, tee shirts, USAP flag, replicated crest of USAP and South Pole Station rebuilding, lifebuoy from the Nathaniel B. Palmer and Wild Bill's bicycle used with rockets attached, at McMurdo Station. It has become the gathering place for US scientists and air crews." "The 'grand old lady' of Cathedral Square, Warners Hotel, will reopen its popular backpackers' accommodation next week. Warners Hotel lessees Stan and Lynne O'Keefe said changes to comply with fire regulations were almost complete. There would be smoke alarms in every room and in corridors. A final inspection would take place early next week and Mrs O'Keefe hoped the doors would be open on Tuesday or Wednesday. The couple, who also run Bailies Bar, said the bar had been losing a lot of custom because of the six-week closure of the backpackers. "We have been turning a lot of people away from the backpackers," she said. "Our grand old lady has a good name all over the world and people come to see us because of it." Mrs O'Keefe said the October demolition order on the building was still hanging over their heads. She said she would much prefer to stay in the original building with all its history. Robert Falcon Scott, the doomed Antarctic explorer, stayed at what is now the backpackers hotel on his way to the South Pole. The visitors' book shows his name. Mrs O'Keefe was keen to preserve the building that holds this and other historical gems. A petition to preserve the Square's heritage building had gathered more than 300 signatures in a week." Cocktails 6.00 pm. Dinner 7.00 pm. Cosmos Club, 2121 Massachusetts Avenue NW, Washington, DC. Dr. David Wilson will present slides and lecture about his great uncle, Edward Wilson of the Antarctic (1872-1912) who was on both of Scott's Antarctic expeditions and died with him on the return from the Pole. Dr. Wilson (the elder) is widely regarded as one of Antarctica's finest artists and pioneering scientist-explorers. He served as assistant surgeon, vertebrate zoologist and artist on the 1901-1904 'Discovery' Expedition and as Chief of the Scientific staff on the 2nd 'Terra Nova' expedition. David's topic is particularly timely given that this year marks the start of the centenary of the 'Discovery' expedition, which represented the first major penetration into the Antarctic Interior. Dr. David Wilson is accomplished in his own right. He earned his "doctor" title studying the philosophical problems of inter-culturalism, and is devoted to locating and protecting polar archives, as well as preserving stories of Antarctic exploration history. Like his great uncle, David is a keen ornithologist, and has frequently lectured on cruises to Antarctica. Dr. Wilson has also co-authored two Antarctic.books: Cheltenham in Antarctica: the Life of Edward Wilson, and Discovery Illustrated: Pictures from Captain Scott's first Antarctic Expedition. Presented in conjunction with the Explorers Club and the Society of Woman Geographers. [Probably limited to members of the three organizations.] For information contact Markie Hunsiker, 5705 Nevada Avenue NW, Washington DC 20015. UPDATE: I attended this event as did plenty of others; it was, in fact, sold out. David's illustrated talk was excellent. Among Antarcticans in attendance: Jackie Ronne and Karen Ronne Tupek, Brenda Clough, Ruth Siple, Paul Dalrymple, Abel Shafer, Joe Bugayer. The next day some of us had fun doing a tour of Antarctic sites in the Washington area: The Wilkes marker on the grounds of the Capitol and the plaque at the Navy Memorial; Lincoln Ellsworth's 'Polar Star' at the Air and Space Museum; and at Arlington National Cemetery, the statue of Byrd and the graves of Byrd, Balchen, Ronne, Wilkes and Eklund. Beetles on the Beardmore - Antarctica Before the Big Freeze. Alan Ashworth, North Dakota State University. Saturday, 1 December 2001. 8.00 pm. What were Antarctica's flora and fauna like before the formation of its continental ice sheet? At last, a fossil site has been discovered providing insight into these. Intriguingly, it also suggests that the onset of glaciation was much later than commonly supposed. The AGM of the Friends of the Scott Polar Research Institute is scheduled for Saturday 17 November 2001 in Cambridge. It will follow David Wilson's talk "Discovery Rediscovered" (see above) which is at 5 pm. A buffet supper follows the meeting; and following that, at 8:30 pm, David Yelverton will talk on "The Discovery Expedition's Forgotten Dimensions: Scott's Western Campaigns and the Discovery of a Continent." By kind permission of King's College School Cambridge, Great Scott!, the world's first Antarctic musical will be performed in the school hall at 2.00 pm 17 November by the choir of Papplewick School, Ascot. Great Scott tells the story in song and dramatisation of the tragic British Antarctic Expedition of 1911-1912 in which Captain Robert Falcon Scott and his four companions perished on their return journey from the South Pole. The piece is the work of two Australians, David Burke and David Jensen and was first performed in the Great Hall of Federal Parliament in Canberra before the then Governor-General of Australia, Sir William Deane. For more information on these events, contact Ann Bean, Secretary, Friends of SPRI at Annbeana@cs.com. SARA WHEELER ON HER NEW BOOK "CHERRY"
"Come and join us as Sara Wheeler shares with us her biography of the life and times of Apsley Cherry-Garrard, one of the youngest members of Scott's final expedition to the Antarctic. Wheeler has travelled extensively in the Antarctic and has had the unrestricted co-operation of Cherry-Garrard's family in writing this biography of the subject's epic journey in the Antarctic winter to collect the eggs of the Emperor penguin. After serving in the 1st World War, Cherry-Garrard was invalided home, where he wrote with the zealous encouragement of his neighbour Bernard Shaw the classic masterpiece The Worst Journey in the World, which has, since it's publication in 1922, touched the hearts of millions. Wheeler examines how Cherry-Garrard's work transformed tragedy and grief into something fine, yet how his own life proved more complicated than literature, and how, as the years unravelled he faced a terrible struggle against depression, breakdown and despair, haunted by the possibility that he could have saved Scott and his companions." A millenium reunion of ex FIDS, ships crews and support staff of Base Z Halley Bay is being organized for 10 November 2001 in the Northants / Warwickshire UK area. Apparently the last major reunion was in the 1970s. For information contact Mary Darrall-Brown, PSA, P.O. Box 203, Shrewsburty SY4 4WT UK. E-mail: mary@overlay.globalnet.co.uk. Tel: 01952 740234. JAMES CAIRD SOCIETY - MEMBERS' EVENING, LECTURE AND A.G.M. To be held in the North Cloister, Dulwich College, London on Friday 9 November 2001 at 6:30pm. Reception and Buffet dinner followed by the program: Professor G.E. Fogg will speak on "Relics in the Antarctic Peninsula" illustrated with some unusual slides. Cost: £20. Deadline for reservations: 5 November. The seventh Annual General Meeting of the Society will be held at 6:00pm in the Board Room at Dulwich College. For further information on the meeting and on membership in the Society, contact The Hon. Secretary, The James Caird Society, School Farm, Benenden, Kent TN17 4EU, UK. Looking Ahead: The spring meeting of the Society is set for 10 May 2002, the same date as the tentatively scheduled Christie's Polar Sale. The UK Antarctic Heritage Trust is sponsoring an event commemorating the centenary of Scott's National Antarctic (Discovery) Expedtion to be held at the Royal Geographical Society, Kensington Gore, London on November 1, 2001 at 7pm. Sir Ranulph Fiennes and others will discuss the importance of this ground-breaking expedition that opened the way for a hundred years of almost continuous British research in the Antarctic. Tickets at £10 are available from the UKAHT. Proceeds of this event will go towards the conservation of Scott's Discovery hut. For further details contact Rachel Morgan, Administrator, UK Antarctic Heritage Trust, Kingcoed Farm, Usk, NP15 1DS, UK. Tel/fax: 01291 690305. E-mail: ukaht@dircon.co.uk. These two exhibitions, on view in Meridian International Center's White-Meyer Galleries, present views of regions which seem remote to many in the United States. In Polar Extremes. Art from Frozen Places, visitors are introduced to the rough and beautiful continent of Antarctica through the paintings of Alan Campbell. The prints ofJessie Oonark depict Inuit history, culture and spirituality in a series of elegant images from the Canadian Arctic. Pill Stefinsson's photographs in the exhibition Iceland. Land of the Vikings, are a vivid representation of his country's diverse environments and dramatic landscapes. The exhibition will be on view from October 25 to December 30 . Georgia painter Alan Campbell has created a most unusual and unique career as a visiting artist with science research programs, taking him to some of the most remote locations on the planet. Following in the tradition of the great exploring expeditions of the past, Campbell has journeyed three times to Antarctica with the National Science Foundation, for a total of over eight months "on the ice". More recently, he has expanded this collaboration with science to work in the rainforests of Costa Rica and Peru with the Organization for Tropical Studies. The resulting exhibitions in New Zealand, Chile and the United States from these projects have not only created an aesthetic of remoteness but have also helped promote a much widerawareness of the major environmental and conservation issues of our day. This quest to convey a unique sense of place has also led the artist to Kenya, the Galapagos Islands, Chile, Ecuador, New Zealand and Italy. Closer to home, he has captured the beauty of Maine, Montana, Alaska and across his native state of Georgia. The works are not scientific illustrations, but my own free interpretation of the elusive and at times surrealistic sights, sounds and sensations of the most magical and mysterious of places. I have painted the turquoise blues and greens of an ice cave in the Canada Glacier, spent days with 5000 Adelie penguins in the rookery at Cape Royds, slept on the floor of the huts of the early explorers Shackleton and Scott, watched killer whales in 2 A.M. sunlight from the stern of an icebreaker, and sat in a place so quiet you could hear your heart beat. These are experiences that elude easy description. --From a flyer available at the exhibit. This is a marvelous show in a very elegant venue. Thirty or more of Campbell's paintings are on exhibit, most from private collections. Several of the newer ones are available (although no prices given). One of his pictures--23 Emperors--is available as a lithograph for $200 (although not available at the exhibit). His website is: http://www.alancampbellstudios.com. Tel: 706-548-2112. PRELIMINARY ANNOUNCEMENT. A meeting sponsored by the Byrd Polar Research Center in collaboration with the Wexner Center for the Arts, The Ohio State University, has been scheduled for October 20-21, 2001 in Columbus, Ohio. 3:00-4:00 PM - Announcement of the Goldthwait Polar Medalist and the Goldthwait Polar Lecture. 4:30-6:00 PM - Reception and Book Signing. Please join us for an opportunity to meet authors of several recently published books concerning polar history and exploration. Authors include: Raimund E.Goerler, and the Frederick A. Cook Society. Other guest authors to be announced. 6:00-7:00 PM - Meeting of the Byrd Polar Research Center Archival Program Advisory Board. Please plan to attend this public meeting and express your views about potential future public programming to be sponsored by the Byrd Center. 1:00-1:30 PM - Public Lecture by Lisle Rose, author of "Assault on Eternity," and currently at work on a biography of Admiral Richard E. Byrd. 1:30-3:00 PM - Special Presentation of "With Admiral Byrd at the South Pole: the Story of Little America." There is no charge to participate in the meeting at the Byrd Center; however, there will be a nominal fee charged by the Wexner Center for a ticket to the movie. For planning purposes we ask that you register in advance for the activities at the Byrd Center. The IMAX film "Shackleton's Antarctic Adventure" opened in London in mid-October, complete with celebrities and royals in attendance. I went a couple days later, on October 20th. Tickets cost 7 pounds, about par with American prices. The London IMAX Theater is only a block from the Royal Festival Hall arts complex, very convenient. The screening I attended was well-filled. In the lobby was an informational exhibit about the film and about Shackleton -- the windproofs the cast wore, maps, and so forth. Making the film seems to have been a harrowing adventure. The unfortunate actors who re-enacted the boat journey were unable to bear up in their period garb, and had to wear Polarfleece and modern insulative garments underneath the Burberrys. The reproductions of the James Caird and other boats that they used in filming were wrecked by storms. The film is replete with dazzling footage of sun and sea and icebergs, all the swooping and soaring effects that have made IMAX films famous. Historical shots of the Endurance expedition, in black and white, are intercut with modern color shots. The huge format becomes perilous when the boats take to the sea. People subject to seasickness should be aware that there are a lot of queasy up-and-down sequences as the boats struggle painfully through stormy seas. The film concludes, a little oddly, with three modern mountaineers who retrace Shackleton's hike across South Georgia island. Their modern jumpsuits and high-tech climbing gear strike the eye strangely, after so much time seeing wooden boats and gabardine jumpers. However, all the historical material is well presented and the film is a must-see for the Shackleton fan. Michael Smith, whose book on Tom Crean has been a bestseller in Ireland, will speak at the Chiswick Town Hall, Heathfield Terrace, W4 on Thursday, 11 October at 7:45pm. Tickets: £4. For details and tickets ring 020 8994 0951. The English edition of the book, published by Headline, appeared on 6 September (£20). "The hostile ice and violent blizzards of the South Pole are being recreated in leafy Chiswick this month--in a bid to raise money for charity. Chiswick author, Michael Smith is delivering an illustrated talk on the adventures of Tom Crean, the unsung hero among the men who first explored the Antarctic 100 years ago. Crean travelled on three of the four major British Polar expeditions and spent more time on the icy Continent than either the more celebrated Captain Scott or Sir Ernest Shackleton. All proceeds will go to the Micro Loan Foundation, the charity run by Peter Ryan of Chiswick and whose patrons include Sir Bob Geldorf. MLF lends small sums of seed corn money to people in the poorest areas of the Philippines to help them become self-sufficient by developing farming, fishing and other of life's essentials Ð "Helping the poor to help themselves."" UPDATE: As the latest newsletter [November, 2001] of The Antarctican Society reports: "The polar fraternity enjoyed the nuances, but the critics were not too kind. Curtains." NOTE: See under 'Antarctic Theatre' elsewhere on this site for more comment. The Coldest March: New Insights into Scott's Fatal Antarctic Expedition. Susan Solomon, National Oceanic and Atmospheric Administration. Saturday, 29 September, 2001. 8.00 pm. A distinguished scientist and author of a recent book on this subject, the speaker brings the power of modern science to bear on the tragic conclusion of Scott's polar journey. Her analysis reveals that exceptional weather rather than human error was primarily responsible for the disaster. The Swedish Antarctic Expedition of 1901-04. Robert Headland, Scott Polar Research Institute. Saturday, 20 October 2001. 8.00 pm. This talk is the first of three in the Polar Centenary Series about major Antarctic expeditions setting out in 1901. This first lecture outlines the context in which several European countries arranged to cooperate in Antarctica's exploration, and tells the story of Otto Nordenskj6ld's memorable expedition. The German South Polar Expedition of 1901-03. Cornelia Lüdecke, University of Munich. Saturday, 10 November 2001. 8.00 pm. The speaker will describe the organisation and achievements of Erich von Drygalski's expedition, setting her talk in the context of national political and naval rivalries as well as international scientific collaboration. David Wilson, Antarctic historian and lecturer. Saturday, 17 November 2001. 5.00 pm. Robert Scott's expedition of 1901-04 was the first to penetrate into the interior of Antarctica, and the first to prove once-and-for-all that Antarctica was indeed a continent. Overshadowed by Scott's second expedition, the speaker will suggest that this expedition has been unjustly neglected. PLEASE NOTE: This lecture will be followed by the AGM of the Friends of the Institute and a buffet. All are welcome to the lecture but Friends only should attend the AGM and buffet. Melinda Mueller, author of What the Ice Gets (see under 'Antarctic Books' elsewhere on this site) will read excerpts from her epic poem on Shackleton's Endurance expedition, on Thursday 27 September from 1:45 to 2:30pm in the Masters' Library, Dulwich College, London. The reading is free. "Melinda Mueller, from Seattle, U.S.A. is a poet and a teacher of Biology at Seattle Academy. She has published three previous collections of poetry in 1976, 1979 and 1998. As a girl she read Lansing's book Endurance, and later listened to Worsley's account of the Endurance expedition at a campfire above the Arctic Circle. Recovering from chemotherapy, the story of Shackleton's expedition having been a great inspiration in enduring diagnosis of cancer, at the James Caird on display at the American Museum of Natural History in New York she was inspired to write, a sequence of poems, 'an epic tale of heroic and motley characters in a fabulous landscape'. Her poems are moving and powerful, both rooted in her wide reading and highly imaginative. Her handling of ordeals and particular poems in character of Tom Crean and Frank Wild are brilliant." --From a flyer for the event. Susan Solomon will present a lecture entitled "Captain Scott's Fatal South Pole Quest Revisited" on September 12, 2001 at 8 pm in Washington DC [previously reported incorrectly as September 28th]. Details and registration information at www.ResidentAssociates.org, or phone the Smithsonian at (202) 357-3030. THIS EVENT HAS BEEN CANCELLED AND WILL PROBABLY BE RE-SCHEDULED. Susan will also be speaking in London at the Royal Over-Seas League (Park Place, St James Street SW1. Tickets: £6) on the 27th of September (in the Travel Lecture series sponsored by Stanfords: www.stanfords.co.uk) and at the Scott Polar Research Institute, Cambridge, on the 29th [see below under SPRI]. Also at the National Geographic Society on Tuesday 6 November at 7:30 pm, 1500 M St. NW, Washington D.C. The NGS events website is www.nationalgeographic.com/lectures, and the phone number is 202-857-7700. See below and under 'Antarctic Book Notes' elsewhere on this site for more information on Susan Solomon and her new book, The Coldest March. A new Memorial to Captain Scott will be unveiled on Scott's birthday--6 June 2001--at Cardiff Bay, Cardiff, Wales. For the latest check out http://captain-scott.members.beeb.net [or elsewhere on this site under Antarctic Art]. --From a recent mailing to members of the Captain Scott Society. Now set--subject to confirmation--for 6 August 2001. --From the Spring 2001 Newsletter of the Society. UPDATE: The autumn (2001) newsletter of the Society reports that the memorial has yet to be constructed much less unveiled. The Welsh Arts Council has turned down an application for a Lottery Grant so it appears that the cost of £18,000 will fall upon the Society to raise. The unveiling is now expected in mid to late 2002. The spring 2001 meeting of the Society is scheduled for Friday, May 18th at Dulwich College, London, commencing at 6:30 pm. Program details: A talk by Professor C. Ripley, Director of the British Antarctic Survey, on "The Work of the British Antarctic Survey." See 'Antarctic Organizations' elsewhere on this site for contact information. Date for Fall meeting: Friday 9 November 2001. Program: Professor G.E. Fogg speaking on "Relics in Antarctica." The world premiere of Sir Peter Maxwell Davis' Antarctic Symphony (commissioned by British Antarctic Survey) is scheduled for Sunday the 6th of May in London's Royal Festival Hall. Davis spent a month in Antarctica to "give him the right inspiration for the piece." No further details at the moment. See under Antarctic Music elsewhere on this site for additional information. Antarctic artist Lucia deLeiris will speak at the Harvard Travellers Club in Boston on 13 March 2001. This is a private dining club although anyone who would like to attend can contact me and come as my paying guest. I've included below the Club notice with logistical details following. "Join Lucia deLeiris on a trip to a remote field camp on the Antarctic Ross Sea where she sketched penguins and seals, explored the abandoned huts of the early explorers, and talked with scientists about their current work. Living in a wooden fish hut on six feet of frozen sea ice for several weeks, Lucia watched a parade of emperor penguins waddling in from the ice edge in the glistening hues of midnight sun, she watched as hundreds of pregnant Weddell seals grated openings with specially adapted teeth in the forming ice cracks, popping out to give birth in the warming rays of the low spring sun. Lucia will talk about the development of expedition art in early Antarctic exploration, the challenges of capturing the Antarctic light, what life is like among scientists and wildlife during the brief season of sun, and the experience of living and painting in temperatures down to minus 52 degrees F.
Lucia deLeiris traveled three times to Antarctica under the auspices of the National Science Foundation's Artist and Writer's Program in 1985-6, 1995-6, and most recently in 1998-9. Her work there consisted of illustrating two natural history books: The Natural History of the Antarctic Peninsula, (by Sanford Moss, Columbia University Press, 1988), and Antarctic Journal: The Hidden Worlds of Antarctica's Animals for children (by Meredith Hooper, National Geographic Society, 2000), and painting landscapes and wildlife for several notable exhibitions. She holds a degree in zoology, has illustrated wildlife for books and magazines and has exhibited widely, combining her two interests: artistic expression and natural history. She has most recently been travelling to do field painting in the Amazon rain forest of Peru." Shackleton: The Antarctic and Endurance The James Caird lifeboat in the North Cloister; An Exhibition in the Old Library. Dulwich College, Dulwich Common, London SE21 7LD. 31 OCTOBER 2000 to 25 FEBRUARY 2001 (closed Mondays, Christmas Eve, Christmas Day and Boxing Day, but open on New Year's Day). 10am to 6pm. Tickets: £6 (adults); £3 (students, children & concessions). 'Shackletonmania'is the word coined by the Wall Street Journal to describe the huge revival of interest in Sir Ernest Shackleton and his several Antarctic expeditions; it has inspired exhibitions world-wide. Leadership, optimism, idealism and superhuman endurance are the lessons of the story; it appeals to all ages. Dulwich College is Shackleton's former school. This exhibition shows the story of Shackleton, his men and the Endurance expedition. The twenty-two-foot lifeboat, the James Caird (owned by the College), will be on display; in this boat Shackleton famously made his eight-hundred-mile journey in 1916 through the worst winter waters in the world to South Georgia to save his marooned men on Elephant Island, following the loss of his ship Endurance which was crushed by the ice. Then followed the epic trek over the unmapped mountainous interior of South Georgia. Paintings, photographs, letters and diaries, documents, sledging pennants, books, ship models, relics of the expeditions and medals will be on display--a great many of them for the first time. Royal flags (including a Union Jack brought back to Buckingham Palace by Shackleton after the Endurance expedition), a 'crow's nest'from Quest (Shackleton's last ship) and a biscuit salvaged from the rations of the Nimrod expedition are among the objects on display. Extracts from Hurley's film South, actually shot during the expedition, and a video about the story can be seen. The exhibition concentrates in detail on Endurance and on Shackleton's career as an explorer. It complements the Antarctic exhibition South - The Race to the Pole at the National Maritime Museum, which opens on 14th September, 2000, and runs for a year. A ticket for one of the two exhibitions given up at the door of the other exhibition will qualify for £1 reduction on the admission charge. Travel arrangements: Dulwich College is situated at Dulwich Common, on the South Circular Road (A205). There is ample parking. By Rail: West Dulwich station is 5 minutes walk away and trains (12 minutes) leave from London (Victoria) at 8 and 38 minutes past the hour. By bus: the No. 3 connects West Dulwich with central London and runs between 4 and 10 times per hour. For visitors wishing to visit the Exhibition at the National Maritime Museum, South - The Race to the Pole, while in South London, the P13 bus travels from Dulwich every 15 minutes to Peckham High Street, where a 177 bus, running at a similar frequency, connects directly with Greenwich. The P13, however, does not run on Sundays. The journey takes about an hour. --From a recent mailing from Dulwich College (August 2000). UPDATE: I saw the exhibit twice during the first week of November. Like the show at the National Maritime Museum it is first rate. The focus is entirely on Shackleton and has great depth. Many items never displayed before and unlikely to displayed again anytime soon. The catalogue is beautifully done, particularly impressive given that it was written and produced in a matter of three or four months. It's more fully described under 'Antarctic Book Notes' elsewhere on this site. Set for October 27-28, 2000, at the Byrd Polar Research Center which is at The Ohio State University in Columbus. Registration: $30.00. 5:30 - 6:30 PM Special Lecture: 'Echoes in the Ice,' by Rik van Glintenkamp. This exhibit in the Sills Gallery of the Main Library will feature a traveling exhibit "Echoes in the Ice: Collages and Drawings of Intrepid Explorers to the Antarctic." Included in the collages are images commemorating such explorers of Antarctica as Ernest Shackleton, Roald Amundsen, Lincoln Ellsworth, Robert Falcon Scott, and Richard Byrd. Rik van Glintenkamp, a film producer, developed collages of historic Antarctic explorers, which have been exhibited in the United Kingdom at the Scott Polar Research Institute at Cambridge University and at the Royal Geographical Society in London. In addition, the exhibit will feature items from the polar collections of The Ohio State University. Particularly noteworthy are original materials from the collections of Admiral Richard E. Byrd, who led or was associated with five expeditions to Antarctica, Sir Hubert Wilkins, who was the first to fly an airplane in Antarctica, and Dr. Frederick Cook, who was the hero of the Belgian expedition to Antarctica, 1897-99. 8:15 - 9:00 AM Registration / Coffee and Donuts. 9:00 - 9:15 AM Welcome Address. 9:15 - 10:15 AM 'Shackleton,' by T.H. Baughman. 10:15 - 10:30 AM Coffee Break. 11:15 AM - 12:00 PM 'Women on Ice: A Light-Hearted Look Back at Women in Antarctic Science,' by Rosemary Askin. 12:00 Noon - 1 PM Lunch at Scott Hall. 1:00 - 1:15 PM Presentation of the Goldthwait Polar Medal - Recipient to be Announced. 1:15 - 2:15 PM Goldthwait Polar Lecture. 2:15 - 2:30 PM Break. 2:30 - 3:15 PM 'Assembling Antarctica: A History of Images,' by William Fox. 3:15 - 3:45 PM 'Oral History Project of the Byrd Polar Research Center Archival Program,' by Raimund Goerler and Laura Kissel. 3:45 - 4:15 PM Closing Remarks. 4:15 - 5:00 PM Reception in Scott Hall. 5:00-6:15 PM Barbeque in Scott Hall. UPDATE: I attended the gathering along with perhaps 80 others. For me the highlights were Rik van Glintenkamp's talk, 'Echoes in the Ice', on his collages featuring Antarctic explorers (many of which were on display in the excellent show at the OSU Library) and Bill Fox's 'Assembling Antarctica: A History of Images' which was an excellent overview of Antarctic art from Cook to the present. The accompanying exhibit in the Philip Sills Exhibit Hall in the OSU Library is up until December 15th. In addition to Rik's collages, there is a variety of photographs, letters, artifacts and the like related to Byrd, Wilkins, Frederick Cook. Among my favorites is a scale model of Byrd's ill-fated Snow Cruiser. R. R. Donnelley and Hermon Dunlap Smith Galleries, The Newberry Library, 60 West Walton Street, Chicago, Illinois. October 7, 2000 - January 13, 2001. "In a world increasingly linked through electronic media and vast transportation networks, the polar regions remain unpaved, largely unpopulated, and difficult to access. Although the scientific explorations of this century have mapped and studied these vast cold spaces, they remain, except for scattered research sites, largely as they have been for thousands of years. A perennial "last frontier," the far North and the far South, and the dramatic stories of expeditions lost and rescued, continue to excite the imagination. Drawing primarily upon the Newberry Library's Gerald F. Fitzgerald Polar Collection, 'To the Ends of the Earth' uses historical documents, first person accounts, rare maps, paintings, and other artifacts, to trace the history of Anglo-American exploration of the North and South Poles. The Library and its galleries will be closed Thanksgiving Day, November 23; Christmas, December 23-25; and New Year's, December 30-January 1. The exhibit is generously supported by Rand McNally. Copyright 2000 by The Newberry Library"
CHICAGO--The story of man versus nature is timeless, manifested throughout history as a daring few push themselves and others to personal and planetary limits. Be it Mt. Everest or the Atlantic Ocean off of Gloucester during a hurricane, be they professional explorers or amateurs, men and women continue to battle the elements, their own character and judgement, and each other as they probe the earth's most extraordinary frontiers. And few places are as harsh as the North and South poles--literally the ends of the earth. From October 7, 2000 - January 13, 2001, the Newberry Library presents To the Ends of the Earth: Exploring the Poles, an exhibit chronicling the journeys of those who dared to explore the Earth's ultimate limits, and the drama of the challenges, competitions, false starts, folly, politics, and heroism that are part of their stories. The exhibit, among the most comprehensive overviews of polar exploration ever presented, highlights more than fifty expeditions and includes first-person accounts, slice-of-life photographs, and vivid illustrations. Drawing primarily from the Library's Gerald F. Fitzgerald Collection of over 750 books, 300 maps, and select artifacts--including Captain Robert Falcon Scott's dress sword--the exhibit spans over 500 years of Anglo-American exploration of the far North and far South. The exhibit includes 28 narrative accounts from the North Pole, from sixteenth-century navigation in search of direct water routes from Europe to Asia, to twentieth-century flights over the North Pole. Historical maps, ranging from Gerard Mercator's 1609 speculative map depicting four arctic islands to a 1959 map showing the course of Commander William R. Anderson's submarine voyage, visually trace the paths of Arctic exploration over the centuries. Twenty narrative accounts from the South Pole cover almost 200 years of Antarctic exploration. From James Clark Ross's 1847 naval expedition journal to Richard E. Byrd's 1930 journal of aerial exploration, the triumphs and tragedies of South Polar exploration are recounted. Historical maps show how geographical representation changed over the years as new discoveries delineated the Antarctic landscape and shaped future expedition routes. A 1763 map based on hypothesis barely resembles a 1930 map of the South Polar region consulted on Byrd's expedition. For more information regarding the exhibit, please call (312) 255-3553. For information regarding exhibit-related programming at the Library, please call the Center for Public Programs at (312) 255-3700. Additional contact: Erika Kneen. Phone: (312) 255-3553. Fax: (312) 255-3543. E-mail: kneene@newberry.org. Web site: www.newberry.org. In collaboration with The Field Museum, an integrated series of six public programs has been developed to complement the exhibitions 'To the Ends of the Earth: Exploring the Poles' at the Newberry Library, and 'The Endurance: Shackleton's Legendary Antarctic Expedition', at The Field Museum from October 7, 2000 - January 14, 2001. For inquiries about programs at the Newberry Library, please call (312) 255-3700. For inquiries about programs at The Field Museum, please call (312) 665-7400. Saturday, October 7, at 10 a.m. The Newberry Library. Panelists: James W. VanStone, curator emeritus, Dept. of Anthropology, The Field Museum; Sharon A. Hogan, University Librarian, University of Illinois at Chicago; Edmund B. Thornton, civic leader, Ottowa, Illinois. Three Illinoisans who have personally experienced the earth's extremes join journalist Bill Kurtis to discuss what motivates humans to explore and live on the "ends of the earth." Saturday, October 14, at 2 p.m. The Field Museum. Lecturer: Caroline Alexander, author and exhibit curator. The guest curator for 'The Endurance: Shackleton's Legendary Antarctic Expedition', a traveling expedition developed by the American Museum of Natural History, brings imagination and rich detail to the story of Ernest Shackleton and his crew. Admission: $12; students and educators $10; members of the Field Museum and Newberry Library Associates $8. Thursday, November 2, at 6:30 p.m. The Field Museum. Lecturer: Ernest S. Burch, Jr., the Smithsonian Institution's Arctic Studies Center. A research associate of the Smithsonian Institution and specialist on Arctic peoples reflects on his experiences in the Arctic and on the evolution of anthropological methodology, 1959-1999. Saturday, November 11, at 11 a.m. The Newberry Library. Tuesday-Friday, November 14-17: eight school programs. The Field Museum. A world premiere multimedia performance dramatizes the experiences, feelings, and accomplishments of polar explorers from the sixteenth to the twentieth centuries with music, projected images, and dramatized readings of first-person accounts. Saturday, December 9, at 11 a.m. The Newberry Library. Lecturer: Lisa Bloom, visiting scholar in Ethnic Studies, University of California, San Diego. The author of 'Gender on Ice: American Ideologies of Polar Exploration' delivers a provocative slide lecture on how the arctic was imagined in nineteenth- and twentieth-century visual culture. Mapping the Poles Saturday, December 16, at 11 a.m. The Newberry Library. Lecturer: Robert W. Karrow, Jr., Administrative Curator of Special Collections and Curator of Maps, The Newberry Library. In a slide lecture drawn from the Library's Gerald F. Fitzgerald Polar Collection and related materials, the curator of 'To the Ends of the Earth' illustrates and analyzes the history of polar cartography beginning with the earliest European expeditions. Available from the University of Chicago Press or The Newberry Library from October 2000: The Gerald F. Fitzgerald Collection of Polar Books, Maps, and Art at the Newberry Library. Compiled by Patrick Morris and David C. White, edited by Robert W. Karrow, Jr. Distributed by the University of Chicago Press for the The Newberry Library. 227 p., 16 color plates, 10 halftones. 7" x 10" Cloth $35.00 ISBN 0-911028-68-4. Paper $25.00 ISBN 0-911028-70-6. With almost 300 maps, 767 books, and two dozen art works and artifacts, the Gerald F. Fitzgerald Collection is a major assemblage of material on the discovery and exploration of the Arctic and Antarctic regions. This catalog provides full descriptions of all the important nineteenth and twentieth century published accounts, the personal map collection of explorer James Mann Wordie, and manuscript letters of Peary, Scott, Shackleton, Mawson and others. The book concludes with detailed indexes to authors, titles, and subjects. UPDATE: I travelled out to Chicago to see this exhibit and to attend Bob Karrow's talk on 'Mapping the Poles' on December 16th. Appropriately, the windchill that weekend was lower than anything I've experienced in the Antarctic. The Newberry is a great library in a great building and if you're in Chicago try to stop by. The exhibit--and the collection it highlights--is excellent. The Newberry's holdings of Antarctic material, almost exclusively represented by the maps, books and art donated by Gerald Fitzgerald, are the largest of any American institution (I, at least, know of nothing larger). The accompanying catalogue is well worth purchasing (see above). The exhibit is mounted in two rooms on either side of the main entrance to the building, one is devoted to the Arctic, the other to the Antarctic. Some of the highlights in the latter include: Copies of Shackleton's 'Aurora Australis' and the vellum three-volume edition of 'Heart of the Antarctic;' the 'South Polar Times;' Fanning's 'Voyages' (1833); an interesting chart of the South Shetlands by George Powell (1822); a nice pencil and pastel study of Richard Byrd and his dog Igloo by Richard Adam (1928) (illustrated in the catalogue); Byrd's reindeer skin mukluks; Scott's ceremonial sword; an oil painting by Frank Kniveton of Scott's men in the wardroom of the Terra Nova (1919) (illustrated in the catalogue); and several Mawson and Scott letters. There's also a typed document noted as 'strictly private' and entitled "Proposed Trans-Antarctic Expedition" that lays out the objects of Shackleton's Enduranc expedition. Most of the maps in the Fitzgerald Collection were purchased from Maggs from the collection assembled by Sir James Wordie, chief of the scientific staff on the Endurance expedition. The Bi-Annual Meeting of the American Polar Society is slated for October 4-6, 2000, at the University of Colorado at Boulder. Conference Title: Polar Research from the Last to the Next Millennium. Registration fee: $100 (includes Awards Banquet). Further information: Check the conference website at www-nsidc.colorado.edu/aps2000. 7-9 pm. Ice Breaker reception, with special access to the Shackleton Exhibit in Special Collections. 8:30 - noon. "Where Have All the Data Gone? Data Profiling." 1:30 - 5:00. "Human Impacts on the Environment." 8:30 - noon. "From Dog Sled to Satellite." 1:30 - 5:00. "From Dog Sled to Satellite - continued"
Meeting coordinator: Dr. Ernest E. Angino, Department of Geology, Lindley 120, University of Kansas, Lawrence, KS 66045. E-mail: rockdoc@cjnetworks.com. Local organizer: Ms. Julie McKie, CIRES, University of Colorado, Campus Box 216, Boulder, CO 80309-0216. Tel: 303-492-1595. FAX: 303-492-1149. E-mail: mckie@cires.colorado.edu. UPDATE: The weather in Boulder was cold and rainy which was fine as we were inside most of the time. The Conference had about 90 attendees. For me the highlights included Susan Solomon's talk 'On the Role of Weather in the Death of Robert Falcon Scott and Companions' (see 'Antarctic Book Notes' elsewhere on this site for mention of her book due out next year), Dave Baker's film on Deepfreeze I and Jackie Ronne's talk on East Base. NOTE: EXHIBITION EXTENDED! Michael Smith e-mails to say that the "... National Maritime Musuem in London is to extend the South exhibition because of its popularity. South: The Race to the Pole was due to close in September, but the run has now been extended until January 31, 2002. The official announcement will be made on Monday [20 August]. It seems that 700,000 people have visited NMM at Greenwich since the exhibition opened a year ago. The owners of the various items have given permission to extend the loans. To mark the extension, NMM is holding a special day of events on Saturday, September 8, 2001... including free performances by actors playing Tom Crean and Apsley Cherry-Garrard, workshops for children and a lantern show by Broke Evans, son of Teddy Evans." UPDATE: The 'James Caird' has been moved from Dulwich College and is now being displayed as part of the NMM exhibition. "The World's first major exhibition on Scott, Shackleton & Amundsen. The Norwegian sledging flag taken to the South Pole by Roald Amundsen - claiming the Pole for Norway ahead of Captain Scott's ill-fated expedition - is one of the star exhibits in a forthcoming major exhibition at the National Maritime Museum. SOUTH: the race to the Pole will be the world's first exhibition devoted to the story of three heroes of Antarctic exploration: Captain Robert Falcon Scott, Sir Ernest Shackleton and Captain Roald Amundsen. 'South' runs from 14 September 2000 to September 2001 in the Canadian Pacific Special Exhibitions Gallery at the National Maritime Museum and is sponsored by A T Kearney and supported by Burberry, the Corporation of Trinity House and Orient. Scott's sledging flag - flown at the Pole in January 1912 and recovered from the tent near Scott's frozen body. Shackleton's boat compass - used on his epic 800-mile journey in a small boat to safety and the Couch on which Shackleton collapsed when he finally completed the journey at a Norwegian whaling station in South Georgia. Artefacts from the Museum, some recently secured at auction (September 1999 at Christie's) will be joined by material from other museums, institutions and private collections. The Scott Polar Research Institute is working with the Museum and is lending artefacts for the first time. Many items from the Fram Museum in Norway will be displayed for the first time in the UK. Captain Robert Falcon Scott (1868-1912), Captain Roald Amundsen (1872-1928) and Sir Ernest Shackleton (1874-1922) are among the most celebrated explorers of the 20th century. Each risked his life to explore the unknown continent of Antarctica. 'South' will explore fully the British and Norwegian expeditions of scientific discovery - Scott's expedition on the Terra Nova (1910-13) and Amundsen's on Fram (1910-12). Shackleton's solo venture to reach the Pole in Nimrod (1907-09) and his attempt to traverse the Antarctic continent on Endurance (1914-17), culminating in his incredible 800-mile journey to safety in the boat James Caird, will also be examined. These expeditions constitute some of the greatest examples in history of pioneering exploration and courage in the face of extreme hardship. Contact National Maritime Museum, Press Office, Greenwich, London, SE10 9NF Telephone +44 (0) 20 8312 6745 / 6545 / 6790, fax +44 (0) 20 8312 6521 E-mail mxbarrett@nmm.ac.uk or kvcannin@nmm.ac.uk"
UPDATE: I visited the exhibit on November 1st and it's excellent. Particularly welcomed are the large number of Amundsen items, mostly from the Fram Museum and the Ski Museum in Norway. One of the Emperor Penguin eggs from the 'Worst Journey' to Cape Crozier is on display. The catalogue--South The Race to the Pole--is excellent (more fully described under 'Antarctic Book Notes' elsewhere on this site. UPDATE: The listing below has been revised and corrected based on a second visit in May, 2001. KEY: NMM=National Maritime Museum. RGS=Royal Geographical Society. SPRI=Scott Polar Research Institute. Capt Cook portrait by James Dance. From NMM. Terra Nova figurehead. From Welsh Industrial and Maritime Museum. Two Ponting photos: Pancake Ice, from a private collection. Wave crashing on iceberg, from NMM. Ponting photo of Evans, Forde, and Crean repairing sledge. From a private collection. William Colbeck's sledging flag from Southern Cross expedition. Skull and crossbones. From NMM. Portrait of Scott by Harrington Mann. From RGS. Nansen sledge used on Discovery expedition. From RGS. Emperor Penguin. Brought back by Discovery expeditiion, skinned by Dr Wilson. From NMM. Three small pen and ink drawings by Wilson. From NMM. Very large leather-covered telescope made by Ross used on Discovery. From NMM. Crew on board Discovery at East India Dock 16 Sept 1904. Photo by Thomson. From NMM. Ticket for launch of Discovery. From NMM. Printed "appeal on behalf of the National Antarctic Expedition." From NMM. Model of Discovery. From RGS. Large detailed plan of the Discovery. From NMM. Portrait of Sir Clements Markham by George Henry 1913. From RGS. .303 Greener rifle used on Discovery. From a private collection. Ice axe used on Discovery. From NMM. Two watercolors by Wilson: Paraselena Jan 15.11 and Mt Erebus. From SPRI. Photo album from the Discovery compiled by Ernest Shackleton. From NMM. Capt Colbeck's photo album from Discovery. From NMM. Letter from Scott to Admiral Markham 27 Feb 1903. From NMM. Copy of 'The Blizzard'. From NMM. Discovery entertainment program. From NMM. Pannikan used on Discovery sledging journeys. From Dundee Heritage Trust. Sledging compass from Discovery. From NMM. Skin of a female snow petrel. From NMM. Emperor penguin egg. From Cape Crozier by E. Wilson 13 Sept 1903. From the Natural History Museum. Bar of silver extracted from Antarctica. From a private collection. Piece of chocolate left at Hut Point. Brought back by Nimrod. No indication of ownership. Three sandstone and limestone rock samples from Discovery. From Dundee Heritage Trust. Captain Colbeck's lantern slides from two relief expedtions. No indication of ownership. Written document entitled "Arrangements for Abandoning the 'Discovery'" Signed by Scott. From NMM. Sir Clements Markham's silver presentation sledge. From NMM. Printed dinner menu of Savage Club. 5 November 1904. From NMM. Program of Sports for 8 Nov 1902 in honor of birthday of King Edward VII. Signed photo of Shackleton. By Lallie Charles, London. From NMM. Photo of Shackleton. By G.C.Beresford, London. From NMM. Photo of Shackleton and Prime Minister Balfour. 29 June 1909. From NMM. Shackleton sketch of his proposed route to the South Pole, Nimrod expedition. On stationery of the Grand Hotel, Eastbourne. From NMM. The Invernairn Letters. Donated in 1958. First time on display. From NMM. Portrait by unknown painter of Oates. From the Oates Museum. Ponting photo of Oates with ponies in stable. From a private collection. Terra Nova burgee. From NMM. Murray Levick's sleeping bag. From NMM. Amundsen's wolfskin jacket and trousers. From Fram Museum. Burberry parka and trousers taken on Fram expedition. From Fram Museum. "Ponko" Ponting Penguin toy. From NMM. Scott's lucky horseshoe [painted white]. From RGS. Plate camera used by Ponting. From SPRI. Burberry parka and trousers from Terra Nova. From SPRI. Model of a husky with a leather harness used on Fram expedition. From Ski Museum. Very large coal briquet (at least 1 foot square) from Terra Nova. From National Museums and Galleries of Wales. Ponting photo of the return of the Western Geological Party ca. Jan 1912. From a private collection. Ponting photo of Wilson and Bowers reading thermometer. From a private collection. Ponting photo of Biologist Dennis Lille with sponge. From a private collection. Ponting photo of Thomas Clissold and Dr. Atkinson hauling up a fish trap. From a private collection. Album of photos by Ponting. From NMM. One of the three intact Penguin eggs from Cape Crozier. From the Natural History Museum. Emperor Penguin embryo in glass bottle. From the Natural History Museum. Parts of a chemistry set used on the Terra Nova. From RGS. Cine camera used by Ponting. From a private collection. Cartoon of Capt Oates and Edward Atkinson August 1910 by DGL (Dennis Lillie). From the Forest School, London. Photo of Wilson in tropical clothing; photo of Scott in tropical clothing. From NMM. Midwinter dinner menu 22 June 1911 done by Wilson. Shows Cape Evans hut, signed by several members. From Dundee Heritage Trust. Portrait of Shackleton by unknown artist about 1910. Ca 3'x2.5' From RGS. Ships bell from the Nimrod. From RGS. Plaster molds of RGS Polar medal commemorating Nimrod expedition, ca. 10" across. From RGS. Two orthoclase crystals from Mt Erebus. From SPRI. Dr Eric Marshall's sledging journal. From RGS. Balaclava worn by Shackleton on his furthest south journey. Presentation to Frank Thornton. From RGS. Shackleton's phonograph record, RCA Victor, recounting his dash to the Pole in 1909. From NMM. Nimrod commemorative postcard. From NMM. Elaborate wood gramophone with a big speaker. Taken on Fram expedition. From Fram Museum. Blubber hooks, harpoon and flensing knives associated with Amundsen. From Fram Museum. Dental equipment associated with Amundsen. From Fram Museum. Medical kit associated with Amundsen. From Fram Museum. Leg brace associated with Amundsen. From Fram Museum. Small oval shaped snowshoe from Discovery. From SPRI. Model of Scott's motor sledge. No indication of where it came from. Amundsen's ski boots. From Fram Museum. Scott's overshoes. Taken south. From NMM. Container for matches and metal match box. Taken on Fram expedition. From Fram Museum. Amundsen's knife. Taken to South Pole. From Fram Museum. Model of the Fram. From Fram Museum. Film cine camera used on Fram expedition. From Fram Museum. Ponting photo of Scott's birthday party 6 June 1941. From a private collection. Scott's sledging satchels and sledging goggles. From NMM. Match box with safety pins. From a private collection. Metal match box. From RGS. Dog harness and collar from Terra Nova. From Dundee Heritage Trust. Tom Crean's skis. From Cyfarthfa Castle Museum and Art Gallery, Merthyr Tydfil. Dog Harness and whip taken on Fram expedition. From Fram Museum. Pony snow shoes used on Terra Nova. From Dundee Heritage Trust. Large Nansen cooker. From SPRI. Pair of Finneskoe. From NMM. Items taken on the Fram expedition: Tinned meat, Knorrs linsen-suppe, Cadbury's cocoa essence. From Fram Museum. Items taken on Terra Nova: jar of honey (from Cheltenham Art Gallery). Tin of Horlicks Malted Milk (from Oates Museum). Bovril pemmican (from SPRI). Sledging biscuit. From a private collection. Dr Wilson's watch found at Scott's last camp returned to Oriana. From Cheltenham Art Gallery. Bags of curry and rice found at Scott's last camp. From RGS. Summit ration bags found at Scott's last camp. From NMM. Scott's silk sledging flag found at last camp. From NMM. Capt Scott's skis made by L.H. Hagen & Co. From Ski Museum. Capt Scott's journal. From the British Library. Capt Scott's journal wallet, pencils and 'housewife'. From a private collection. New Testament belonging to 'Birdie' Bowers. From SPRI. Prayerbook from which Dr Atkinson read the burial service 12 Nov 1912. From Cheltenham Art Gallery. Letter from Teddy Evans on board the Terra Nova to Admiral Markham 3 Feb 1913. From NMM. Letter from Francis Drake on board Terra Nova to Admiral Markham 25 Jan 1913. From NMM. Letter from Admiral Markham to Capt Scott 22 Aug 1912. From NMM. Ponting photos of Edgar Evans; Capt Oates, Wilson painting; Birdie Bowers. All from private collections. Parts of primus stove found at Scott's last camp. From NMM. Sledging compass taken by Amundsen's party to the Pole. From Fram Museum. Large Norwegian flag flown at the Pole, triple swallowtale. From Fram Museum. Theodolite taken by Scott's party to the Pole. From NMM. Pocket camera taken by Scott's party to the Pole. Fold-up bellows camera; all photographs of Scott's journey to the Pole were taken with this folding camera. From a private collection. Union flag flown at the Pole by Capt Scott on a staff with a silver plaque. From the collection of The Queen. Boot belonging from P.O. Evans. From Swansea Museum. Dr Atkinson's sledging flag. In a wood case. Tree in center. "In pectori robur". From Forest School, London. Wyllie's etching of Scott's message to the public. From NMM. Scott commemorative postcard. From NMM. Service for the unveiling of the Scott memorial at St Paul's Cathedral 5 May 1916. From NMM. German medal presented to Amundsen. From NMM. Daily Mirror placard 13 Feb 1913. Headline: 'Heroic Captain Scott and his son Peter'. From SPRI. Plaster maquette of the polar party by an unknown artist. A model for a public scupture that was never cast in bronze. Shows Scott standing in the center looking at a compass (? ), 4 men behind him appearing to put up or take down a tent. Their names are engraved in the back. From RGS. Queen's Hall announcement of a lecture by Teddy Evans Wednesday 4 June. From SPRI. Impressionist painting ca. 3x2.5 feet "The Angel of Aurora Guarding the Heroes" by Frank Wilbert Stokes 1927. This painting commemorates the Scott tragedy. From RGS. Booklet of Shackleton family holiday photographs from Sheringham 1910. From NMM. Letter 13 Jan 1914 from Shackleton to Elspeth Beardmore. From NMM. Menu card showing Shackleton's proposed Imperial Trans-Antarctic route. Dated 7 March 1914. From RGS. Photo of Aeneas Macintosh in a merchant marine uniform. From NMM. Epitaph by Shackleton to the three casualties of the Ross Sea Party. From NMM. Small model of the Endurance being crushed in the ice by an unknown maker, mounted on wood base. From RGS. Annotated pocket bible from the Endurance. Notes in the margin were made by the second officer, Hubert Hudson, at Patience Camp on the ice. From a private collection. Page from the Encyclopedia Britannica with a handwritten poem 'When.' From a private collection. Hussey's zither banjo signed by members of the expedition including Shackleton. From NMM. Wooden tent peg knife. From a private collection. Tartan shirt made by Chippy MacNeish. From a private collection. Spoon used for eating hoosh. From a private collection. Liquid boat compass thought to have been used on the James Caird. From NMM. Typewritten copy of Frank Worsley's log of the James Caird voyage. From SPRI. Sextant used on the James Caird voyage. From a private collection. Chronometer thought to have been used on the James Caird. From NMM. Victorian style settee. Used at Stromness. From NMM. Admiralty chart of South Georgia. Shows route taken by Shackleton added in pencil. From NMM. Royal standard taken on Endurance expedition. From a private collection. John M. Levinson, M.D. has generously prepared and loaned numerous items from his personal collection of artifacts about Polar exploration, natural history, and art to the Delaware Museum of Natural History. The display of Polar artifacts complements the Museum's current exhibit, Pole to Pole, and will be open to the public through August 30, 2000. Visitors to the Polar Room will see many items that are both unique and of historical importance. Levinson, a Fellow of the Royal Geographical Society and Past President of the Explorers Club (1985-87), is a resident of Rockland, DE. Levinson has had extensive experience as a ship's surgeon on numerous Polar expeditions and has co-edited a book about Polar travel entitled, SAFE PASSAGE QUESTIONED: Medical Care and Safety for the Polar Tourist. A dinner plate used by Robert Falcon Scott, RN on the Terra Nova expedition in 1911. Dr. Levinson's red parka used on many trips to the Arctic and Antarctic has patches he obtained from numerous polar stations. Rare books including the Aurora Australis. This book was printed in Antarctica during Ernest Shackleton's Nimrod expedition (1907-09) and only 58 copies of the book are known to exist. The Union Jack, presented to him [Shackleton] by Queen Alexandra, was hoisted in 1909 by Ernest Shackleton at 88° 23'south, only 97 nautical miles from the South Pole. For this extraordinary feat, he was knighted. He truly discovered the route to the South Pole. The flag is considered the most historic flag known to exist from man's quest for either the North or South Pole. Also on display is the artwork of Keith Hope Shackleton a renowned artist and naturalist who lives in Devon, England. Mr. Shackleton is a distant relative of the famous Polar explorer, Sir Ernest Shackleton, and is the past President of the Royal Society of Marine Artists and the Society of Wildlife Artists, and is currently the Vice President of the Guild of Aviation Artists and the Wildfowl & Wetlands Trust. The paintings on display are tlie largest single collection of Keith Shackleton's polar work currently on display in the U.K. or the USA. As part of the programming of 'Pole to Pole', Dr. Levinson will make two slide illustrated presentations about Polar travel. The first lecture based upon his book, Safe Passage Questioned, will take place on June 29 from 7 to 8 PM at the Delaware Museum of Natural History. Levinson will discuss the medical concerns facing tourists to the Polar Regions and reflect upon some of his experiences traveling to the North Pole and distant areas of Antarctica. Dr. Levinson returns to the Museum on July 13 at 7 PM to discuss the life and personality of Sir Ernest Shackleton and his 1914 expedition to the Antarctic. This extraordinary explorer closed what is called "the heroic age of Antarctic exploration." Shackleton is most remembered for leading the fabled Endurance expedition, in which his men survived for ten months on ice floes and on a barren uninhabited island after their ship was crushed by pack ice. Shackleton made two open boat journeys, one of which -- a treacherous 800-mile ocean crossing to South Georgia Island -- is now considered one of the greatest small boat journeys in history. The Museum will open its doors for the lectures at 6:00 PM and will remain open until 8:30 PM so visitors may see the Polar Room before and after Dr. Levinson's presentations. The museum is open Monday through Saturday 9:30 am to 4:30 PM; Sunday noon to 4:30 PM. Admission is $5 for adults, $4 for seniors and $3 for children ages 3-17; children 2 and under are admitted free. The museum is located on Rt. 52, the Kennett Pike, just 5 miles north of Wilmington and 3 miles south of the Pennsylvania border. For more information about this and other Museum exhibits and programs, call (302) 658-9111 or visit online at www.delmnh.org. Box 3937, Wilmington, DE 19807-0937, USA. Tel: 302-658-9111. Fax: 302-658-2610.	www.delmnh.org. Contact: Stephen Reynolds. Andy's Summer Playhouse of Wilton Center, New Hampshire, is celebrating its 30th year of presenting innovative theatre productions by children. One of its productions this summer--playing 2-6 August 2000--was an interesting and very well done Antarctic piece by Louise Smith, after a concept by Robert Lawson and directed by Emmanuelle Chaulet, entitled Endurance. "Inspired by Shackleton's 'Endurance' expedition of 1914, this tale takes us on a journey to Antarctica in an attempt to map the vast continent. However, ice and fate conspire to turn this exploit into one of the most astonishing survival stories of the 20th century." FROM IRELAND TO ANTARCTICA: SIR ERNEST SHACKLETON - A VERY SUCCESSFUL FAILURE? A talk by Jonathan Shackleton, Friday evening at 8pm at the Amos Fortune Forum, July 7, 2000. The Jaffrey Meetinghouse, Route 124, Jaffrey, New Hampshire. Free and open to the public. Ernest Shackleton has recently become one of the most admired and popular figures of the Heroic Age of Antarctic exploration during the early years of the 20th Century. He travelled on four expeditions to the Antarctic, leading three of them; the third expedition, on his ship the Endurance, turned into one of the greatest survival stories of all time. This expedition is celebrated at Salem's Peabody Essex Museum until September 10th. The importance of his Irish and Quaker family background has been overlooked as has the achievements of his other expeditions. What was it about his character and the nature of his leadership that inspired so much admiration and loyalty amongst those who travelled with him? Jonathan Shackleton was born in Ireland and lives in County Cavan with his wife Daphne and their three children. He graduated with an Honors Degree in Natural Science at Trinity College Dublin and was awarded his Masters at Ohio State University for work on Arctic Lakes. The Shackletons are involved in farming, forestry and have a garden which they open to the public. He is a devoted Antarctic enthusiast, lecturer, traveller (five visits to the Antarctic so far), book collector and the family historian of the Irish branch of the Shackleton family. He enjoys picking over the bones of his ancestors and adding entertaining pieces of historical flesh to them. Sadly, the James Caird, the boat that played such a important role in the Endurance saga, will not be in the show. She's safely home at Dulwich College in London and there are no plans at the moment for her to travel off again. In place of the original, however, will be a new replica James Caird built by Bob Wallace. The first replica he made was abandoned in the Antarctic during the making last year of the IMAX and PBS Shackleton films. The exhibit has been very well set up, with far more space than in New York. Also, some Antarctic items--artifacts, maps, etc.--from the Museum's own collection have been added. By the way, if you visit the Museum be sure to see the ancient-looking King Penguin and the fine oil painting of Charles Wilkes' Vincennes (used on the cover of the Smithsonian's Magnificent Voyagers and said possibly to be by Wilkes himself) in East India Hall. Last night (22 June) Jonathan Shackleton gave two back-to-back talks to Museum members and their guests, a total of about 800 people. Dan Finamore, Russell W. Knight Curator of Maritime Art and History, noted that this attendance probably was a record for the 200 year old institution. This exhibit is likely to be a blockbuster. LOOKING AHEAD: From Salem, the exhibit moves on to Chicago (Field Museum) 7 October 2000, through 14 January 2001 [http://www.fmnh.org/exhibits/endurance_tempexhib.htm]; Houston (Museum of Natural Science) Dates? [http://www.hmns.org]); and Seattle (The Burke Museum of Natural History and Culture) 7 June through 31 December 2001 [http://www1.cac.washington.edu/burkemuseum/exhibits.html]); and probably elsewhere after that. CRREL--The Cold Regions Research and Engineering Laboratory--will be hosting an exhibit of Antarctic Art & Artifacts and Other Odds & Ends from the collection of Robert B. Stephenson. It will run from June 19th through October 31st, 2000 [extended to mid-November]. CRREL, a US Army facility, is located at 72 Lyme Road (Route 10) Hanover, New Hampshire 03755. Open to the public without charge, Mon-Fri 9-4. For additional information, call 603-646-4779. For a virtual tour of the exhibit, click here. TERRA NOVA: the Race to the South Pole, by Ted Tally. Project Y Theatre Company and Washington Shakespeare Company. April 24 through May 19, 2000. UPDATE: I saw this last Saturday night (18 March) along with 4 other Antarcticans. We all thought it was great, especially for an amateur production. If you're anywhere nearby before the 5th try to make it. Place: Byrd Polar Research Center, Scott Hall, 1090 Carmack Road, Columbus, Ohio 43210-1022. Beginning at noon on Friday the 15th and running through a Saturday evening banquet and featuring a range of speakers and Antarctic subjects. The Honorable Alexandra Shackleton, granddaughter of the famous explorer, will introduce an illustrated talk by her cousin, Jonathan Shackleton. Saturday evening, October 9th, 1999 at 7:30 pm at the Woodstock (Vermont) Town Hall Theatre. Booksigning and reception will follow. Underwritten by Miranda Thomas and Charles Shackleton. All proceeds go to the Pentangle Council on the Arts. Tickets: $18. For bookings, call (802) 457-3981.